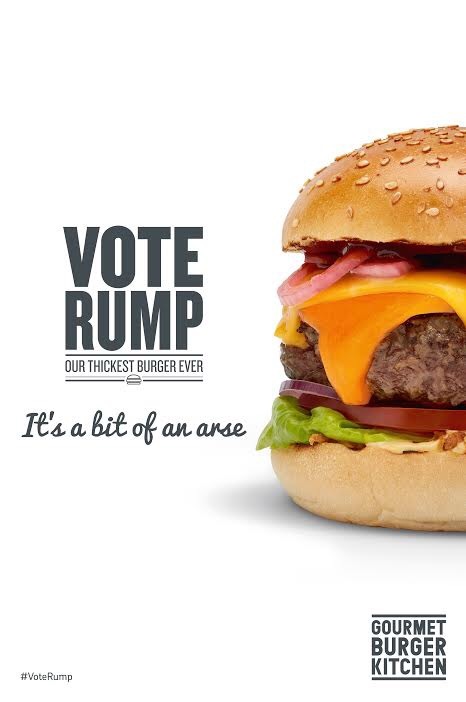 Gourmet Burger Kitchen, the original purveyors of posh burgers in the UK, have released a very amusing new poster promoting their ‘thickest burger ever’: The Rump. Not quite content with just mocking the Republican Presidential nominee with the formulation of their product, they’ve also given it an amusing brand positioning “it’s a bit of an arse”. Very good. Credit to You Agency for putting it together and thanks to @ggranted for sending.